Sportier and more efficient than ever thanks to state-of-the-art BMW eDrive Technology: the new BMW 330e Sedan. Dubai, UAE, December 30, 2018: Engine portfolio supplemented for the new generation of the sports sedan with the addition of plug-in hybrid drive – electrically powered range increased as compared to predecessor model by 50 per cent to 60 kilometres* – CO2 emissions reduced by more than 10 per cent – enhanced sprint power: standard XtraBoost further increases drive output on a temporary basis to as much as 30 kW/41 hp – market launch in summer 2019. Munich. Superior driving dynamics and exemplary efficiency are the key characteristics of the new BMW 3 Series Sedan. With the extension of the engine portfolio to include a plug-in hybrid system, these essential properties of the new sports sedan acquire an additional and especially pioneering dimension. In the new BMW 330e Sedan, the latest generation of BMW eDrive Technology is combined with a 4-cylinder petrol engine to provide a significant increase in sporty flair as well as an even more intense electrically powered driving experience. The first ever standard XtraBoost integrated in a BMW model temporarily increases the system output of the plug-in hybrid drive from 185 kW/252 hp with an addition of up to 30 kW/41 hp. In addition to spontaneity of response, this also increases the electrical range of the new BMW 330e Sedan as compared to the predecessor model by 50 per cent. It is now possible to cover a distance of up to 60 kilometres* on a locally emissions-free basis. Fuel consumption and emission figures are reduced by more than 10 per cent as compared to the predecessor model to up to 1.7 litres* per 100 kilometres and up to 39 grams* per kilometre. In the new BMW 330e Sedan, intelligently controlled interaction between the electric motor and the combustion engine reaches a whole new level. More than ever, the electrification of the powertrain contributes not just to increased efficiency but also to creating a distinctive form of driving pleasure. The plug-in hybrid system comprises a 2.0-litre 4-cylinder petrol engine with BMW TwinPower Turbo Technology and an output of 135 kW/184 hp along with an electric motor which generates a continuous output of 50 kW/68 hp and a peak output of 80 kW/109 hp. Together, the two drive units develop a system output of 185 kW/252 hp along with a maximum system torque of 420 Nm. As a result, the new BMW 330e Sedan accelerates from zero to 100 km/h in 6.0 seconds. Its top speed is 230 km/h. In HYBRID mode, the new BMW 330e Sedan is able to reach a speed of up to 110 km/h when running on electric power alone – 30 km/h faster than the predecessor model. In ELECTRIC mode, locally emissions-free motoring is even possible at speeds of up to 140 km/h – previously: 120 km/h. One new feature of the new BMW 330e Sedan is the standard XtraBoost, which gives the vehicle its highest level of dynamic performance. It is easy to access by activating SPORT mode using the driving experience switch. In order to support the combustion engine in dynamic driving situations, the electric motor with XtraBoost temporarily provides up to 30 kW/41 hp – stored in the high-voltage battery – in addition to its continuous output. This makes the drive characteristics available that are typical of the BMW 3 Series Sedan. For the first time in a BMW hybrid model, this includes an accelerator pedal curve that offers both maximum sporty flair and precision along with a specific shifting programme for the 8-speed Steptronic transmission complete with brake downshifts. The additional XtraBoost makes for a more intense acceleration experience than in a conventionally powered vehicle with a comparable engine output. The XtraBoost can be used up to the minimum charge status of the high voltage battery. It is also available for kickdown manoeuvres and in the M/S position of the gear selector lever. The electric motor of the new BMW 330e Sedan is integrated in the 8-speed Steptronic transmission in order to save space. 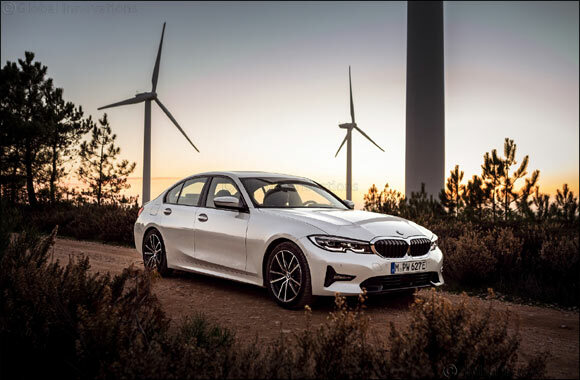 Due to its intelligent design, the hybrid-specific transmission is only 15 millimetres longer than the corresponding versions for conventionally powered models of the new BMW 3 Series Sedan. Power generation achieves a particularly high level of efficiency through the recuperation of braking energy, with the electric motor taking on the function of a generator. The electrical energy fed into the high-voltage battery in this way or via connection to the power grid also serves to supply the vehicle electrical system. This means that a generator powered by the combustion engine is no longer necessary, thereby further increasing the efficiency of the system as a whole. With a gross energy content of 12.0 kWh, the lithium-ion high-voltage battery in the new BMW 330e Sedan enables an electrically powered range of up to 60 kilometres* – 50 per cent more than that of the predecessor model. Meanwhile, fuel consumption and emissions figures are reduced by 10 per cent in the second generation of the plug-in hybrid sports sedan. These now drop to up to 1.7 litres of fuel per 100 kilometres* and up to 39 grams of CO2 per kilometre*. The high-voltage battery in the new BMW 330e Sedan is positioned underneath the rear seats, while the fuel tank is located above the rear axle. This means that luggage compartment volume is only slightly restricted in the plug-in hybrid model. The storage volume of 375 litres can be expanded as required by means of the folding rear backrest with 40 : 20: 40 split. In addition, virtually the entire range of optional equipment features for the new BMW 3 Series Sedan is available for the plug-in hybrid. As alternatives to the basic version, the new BMW 330e also comes in the model variants Advantage, Sport Line, Luxury Line and M Sport. Among other things it can be fitted with the Adaptive M suspension including Variable Sports Steering and the M sports brake system. The full programme of innovative driver assistance systems to optimise comfort and safety is available – ranging from Driving Assistant Professional with steering and lane guidance system to park assistant including reverse assistant. The standard trim of the new BMW 330e Sedan includes pre-heating and pre-conditioning of the interior. Here the energy of the high-voltage battery is also used to power the auxiliary heating. At low outdoor temperatures, the interior can also be conveniently heated prior to setting off – even if the battery charge status is low.For the market launch of the new BMW 330e Sedan in summer 2019, new digital services will be presented which make it more attractive and convenient to charge the battery while out and about. When selecting a public charging station, the navigation system also provides the driver with a list of recommended nearby hotels, restaurants, caf�s, tourist attractions and cultural institutions. Charging station availability can also be checked using the vehicle display and operating system. The driver receives the information along with a forecast of the occupancy status of the public charging station at the time of arrival. In addition, selected charging stations can be reserved for a limited period in the future.